How Far is Kalpataru Pristine at Kalpataru Hills? Kalpataru Pristine at Kalpataru Hills, by Kalpataru group in Manpada, Thane West, Thane is an upcoming residential landmark set amongst the picturesque Yeoor Hills. Living up to its name, Kalpataru Pristine is amidst the pristinely beautiful landscaped greenery. The residential apartments for sale in Kalpataru Pristine offers beautiful, well ventilated spaces that elevates your quality of life. Sprawled over 6.42 acres area, Kalpataru Pristine at Kalpataru Hills in Manpada, Thane West, Thane, stands tall with 20 floor classification showcasing 80 luxury apartments. Kalpataru Pristine at Kalpataru Hills, in Manpada, Thane West boasts latest designs that speaks of its world class standards. Combined with the enviable and unmatched amenities, the flats for sale in Kalpataru Pristine, Manpada are unparallelled. The project offers spacious and skillfully designed 1BHK, 2BHK and 3BHK apartments for sale, which are well equipped with all the amenities to facilitate the needs of the residents. The 1BHK apartments for sale in Kalpataru Pristine on Kalpataru Hills, Manpada are with size 600 sq. ft., the 2BHK apartments are with sizes varying between 784 sq. ft. - 1224 sq. ft., and 3BHK apartments are with sizes varying between 1206 sq. 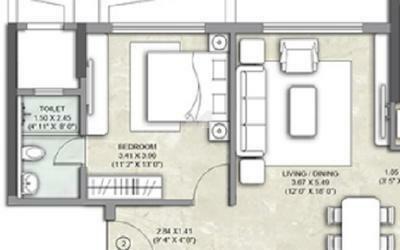 ft. to 1620 sq.ft. Kalpataru group has presented the architecture with green surroundings very beautifully with Kalpataru Pristine on Kalpataru Hills. The location of Kalpataru Pristine is Thane West which is a city which has all the hustle and bustle of its neighbour, Mumbai. It is surrounded by lush greenery, Thane is nestled between Yeoor Hills on one side and Ulhas River on the other. Thane is a part of the Mumbai Metropolitan Region but is a separate city by itself and enjoys great connectivity to the metro city. While it may be tiny, it is heavily populated. Thane has been divided into East and West like almost every other part of Mumbai, depending on the railway station. Apartments with great amenities in bustling neighbourhood of Thane.